Prominent & Leading Exporter from Ambala, we offer antenna trainer with antennas, motorised antenna trainer, advanced antenna trainer, antennas, antennas with stepper motor automatic rotation for receiving antenna and antennas with manual rotation. 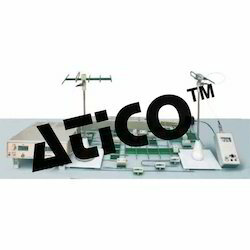 Advanced Technocracy Inc. is Manufacturer, Exporter & Supplier of Antenna Trainer with Antennas. Antenna Rotation : 0-360 deg. Resolution 1 deg. 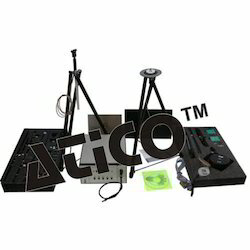 Advanced Technocracy Inc. is Manufacturer, Exporter & Supplier of Motorised Antenna Trainer With Plotting Software. The system consists of a set of two tripods one for mounting the transmitting antenna and another for mounting the receiving antenna, 22 Antennas, RF Transmitter/ Receiver, Antenna Plotting Software and relevant accessories/ cables. 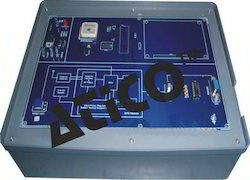 Advanced Technocracy Inc. is Manufacturer, Exporter & Supplier of Advanced Antenna Trainer. Advanced Antenna Trainer With Variable Frequency (550 Mhz - 850 Mhz) And 11 Antennas. Antenna Gain, Antenna Beam Width Study. Element Current, Front-Back Ratio Study. Advanced Antenna Trainer With Variable Frequency (550 Mhz - 850 Mhz) And 22 Antennas. Study of Simple Dipole l/2 Antenna. Performing Polarization Test and Modulation Test. Antenna Current Sensor and SWR Measurement. Antenna, Helix Antenna and antenna bandwidth. RF generator : 550 to 850 MHz approximately(with level adjust). Modulation Generator :1 KHz approximately (300 mV). Directional Coupler : Forward & Reverse (On board selectable). Antenna Rotation : 0- 360 Degree, Resolution 1 Degree Transmitting & Receiver masts provided. Receiving antenna : Folded Dipole with reflector. Detector Display : Adjustable meter. Power Supply : 230 V ±10%, 50/60 Hz. Dimensions (MainUnit-mm) : W 285 × H 75 × D 385. 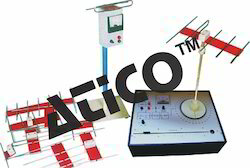 Advanced Technocracy Inc. is Manufacturer, Exporter & Supplier of Antennas with Manual Rotation. Antenna Training System's have been designed to provide useful tools for hands on experimentation and teaching of various commonly used antennas in microwave band in the laboratory for students of all levels. Newly developed Antenna Training System'shave been incorporated with a high end frequency operational range of 3GHz to 4GHz. It can be used in stand-alone mode as well as be interfaced with a computer via USB interface. In this Receiving Antenna can berotated from 0 to 360 Degrees and accordingly Receiving Antennas Signal strength can be monitored. 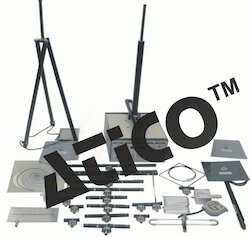 The system consists of a set oftripod for mounting the transmitting and receiving antenna. There are 4 models with various options suited for all teaching methodology and curriculum. Variation of field strength with distance. Plot radiation pattern of omni directional antenna. Plot radiation pattern of directional antenna. Polarization of vertical and horizontal antenna. Study resonant and non resonant antenna and estimate VSWR and impedance. Demonstrate reciprocity theorem of antennas. Study current distribution along the element of antenna. Advanced Technocracy Inc. is Manufacturer, Exporter & Supplier of Antennas With Stepper Motor Automatic Rotation For Receiving Antenna. 10 Antennas With Stepper Motor Automatic Rotation For Receiving Antenna. Antenna Training System's have been designed to provide useful tools for hands on experimentation and teaching of various commonly used antennas in microwave band in the laboratory for students of all levels. Newly developed Antenna Training System's have been incorporated with a high end frequency operational range of 3GHz to 4GHz. It can be used in stand-alone mode as well as be interfaced with a computer via USB interface. In this Receiving Antenna can be rotated from 0 to 360 Degrees and accordingly Receiving Antennas Signal strength can be monitored. 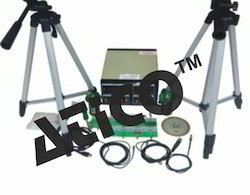 The system consists of a set of tripod for mounting the transmitting and receiving antenna. There are 4 models with various options suited for all teaching methodology and curriculum. 22 Antennas With Stepper Motor Automatic Rotation For Receiving Antenna. Study Resonant And Non Resonant Antenna And Estimate VSWR And Impedance . Study Different Antennas Polar Plots, Radiation Patterns, Gain, Beam Width, Front Back Ratio . 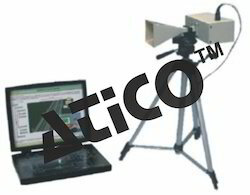 Advanced Technocracy Inc. is Manufacturer, Exporter & Supplier of Radar Trainer. On board alarm for detected signal. Advanced Technocracy Inc. is Manufacturer, Exporter & Supplier of GPS Trainer. Looking for Educational Trainers ?